Bringing generations together, we presented a very special film screening at the Merton Dementia Hub. WCTT projects aren’t just standalone theatre performances or one-off workshops. We use our work to build meaningful relationships within Merton, bridging the gap between schools, community groups and generations. After the debut of Living Memory, the original piece of theatre devised by Act 2 in the summer term, and part of our social and community engagement programme, we felt it was really important that the Merton Dementia Hub members who had shared their stories with us had been fully represented. Many members of the Hub came to watch the performance at New Wimbledon Theatre’s Time & Leisure Studio: Act 2 presented the piece to a full house. But, as not every member of the Hub was able to make it on the day, we decided to record the performance and make a 20-minute film that we could take back to the Hub and present to all the members. On Tuesday 25 September 2018, our creative producer, Andy Alty, and three members of Act 2, Caleb, Calum and Eliott, visited the Hub to present the film…and to catch up with the members who had made such a positive impact on them when they first met in the summer. As well as Dementia Hub’s Tuesday group, the audience also included members’ friends and family, and special guests from the Alzheimer’s Society and Film Merton 2019. The film received a lovely, warm response; many in the audience said how moving the performance was and they were particularly impressed by the accuracy of the dramatisation. 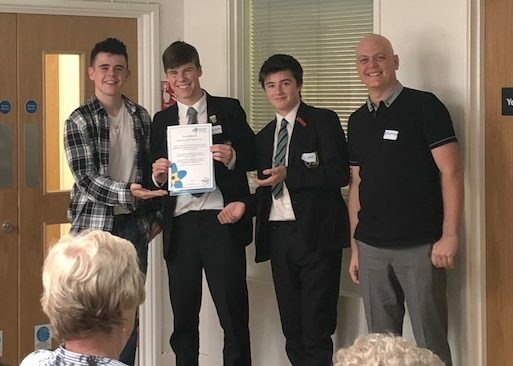 After the screening, our Young Actors were very proud to be presented with a Dementia Friendly Community Certificate, and they stayed on after the show to chat and play games with their new friends at the Dementia Hub. 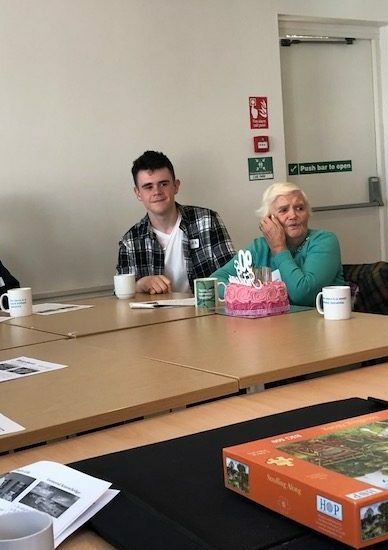 It was a great atmosphere, truly transcending generations – and a brilliant opportunity to celebrate two special birthdays: Philomena’s 90th and Caleb’s 15th. 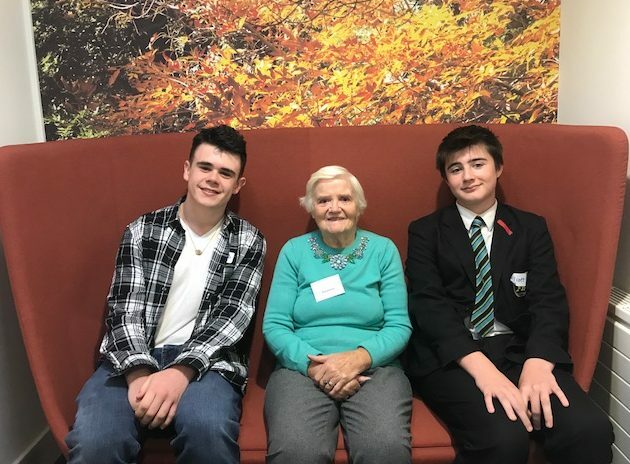 This wonderful project has provided a strong foundation for further inter-generational work and we’re really excited about our new partnership with the Hub. There’s already lots of interest in extending and expanding Living Memory: we’re talking about it with the Alzheimer’s Society, as well as Film Merton 2019. We’d love to keep working on this vital and rewarding project, bringing generations together and raising awareness of a condition that touches the lives of many thousands of families: there are 850,000 people with dementia in the UK, with numbers set to rise to over 1 million by 2025. All donations we receive go towards making projects like Living Memory a reality. This work has had a profound effect on our Young Actors, the members of the Dementia Hub and their families, and the wider community – thanks to your generous support, we can continue to do this life-changing work. If you’d like to find out more about Living Memory, and the other projects we’re working on, we’d love to hear from you.